by Chicago's Zionist police gang! The bizarre arrest of Christopher Bollyn gives us an opportunity to identify some of the criminals who are influencing our police departments. Let's take this opportunity and demand that the police investigate and tell us who is responsible for authorizing this. Please help us let the Zionists gangs realize that some of us are fed up with their abuse. • Most American military personnel who know about the attack on the USS Liberty are afraid to talk about it. • European nations have passed laws to prohibit investigations of the Holocaust because they are afraid of... of what? • Most witnesses to the crash at the Pentagon are afraid to talk about it. When a wolf chases after a sheep, the other sheep run in fear because the sheep don't have the intelligence to realize that they could easily chase the wolf away! So far, all throughout history, when a Zionist abuses a Goy, the other Goyim run away in fear, even though the Goyim outnumber the Zionists by an incredible amount. Will Goyim ever stand up to the Zionists? The abuse that Christopher Bollyn suffered was trivial compared to the abuse suffered by the men on the USS Liberty and the abuse Americans and Arabs are suffering right now in the Middle East. However, they abused Christopher Bollyn in an American city in front of everybody. If we let them get away with this, they may do it to more of us. Was it Homeland Security that ordered it? "But what can I do? I'm just a nobody!" You can help! It doesn't take any money. You can send a link to this article to your own police department, or to the police department in Chicago. The link to send people is here. Send a link to that image to the police. When thousands of people send e-mail messages asking for an investigation, the Zionists will realize that some of us are not docile sheep. 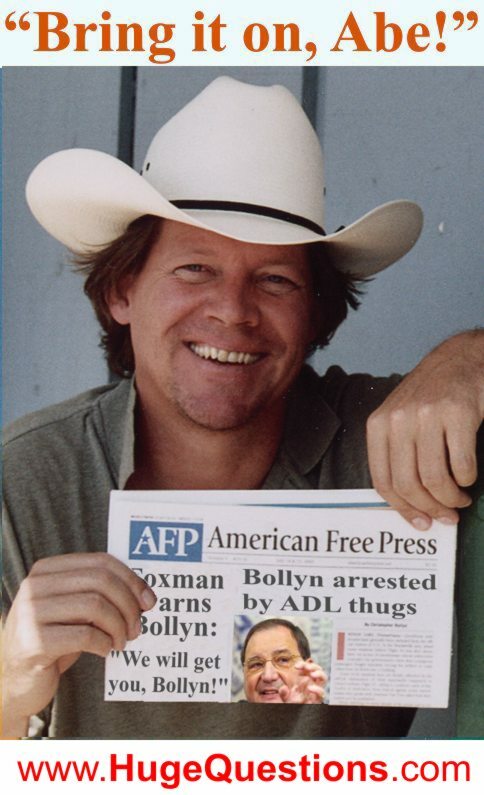 Why doesn't Senator Obama help Bollyn, or care about 9/11, or care about Zionism? You should also send this link to fire departments, military bases, and local government offices. They need to grow up and smell the Zionism, also.